Paul Ryan challenger Paul Nehlen said Sunday that he was banned from Twitter because he stood up for white people. “If you think for one second I’m sorry I lost my Twitter account because I stood up for Whites who were told they came from that Cheddar Man hoax, you are sadly mistaken,” Nehlen wrote on his Gab  shortly after the ban. 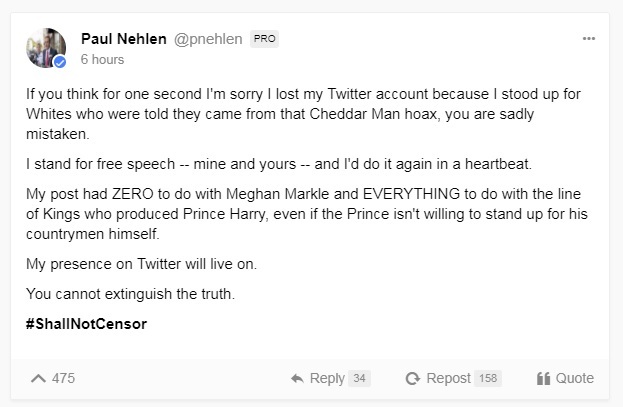 News outlets speculated that Nehlen was banned for sharing a photoshopped image of Prince Harry and Meghan Markle with the “Cheddar Man” shopped onto Markle’s face . The image triggered mass outrage in the British press .